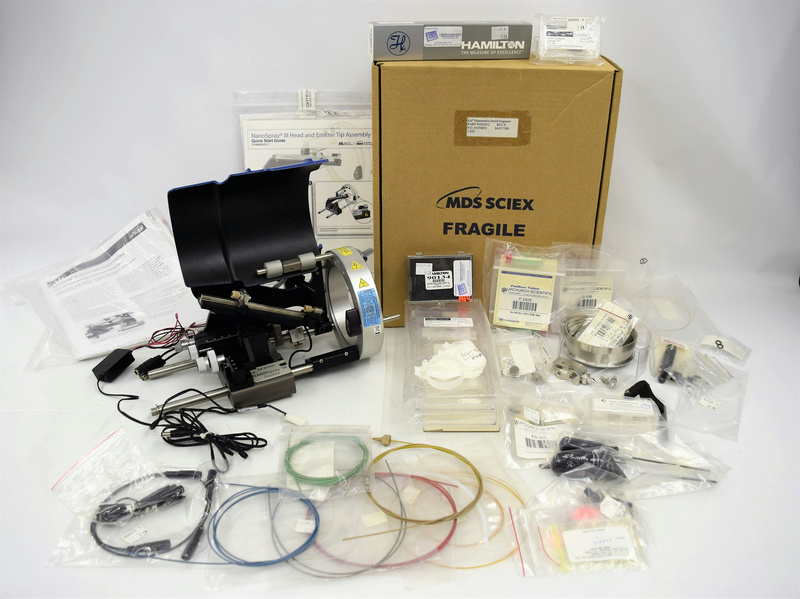 AB Sciex NanoSpray III Source & Heated Interface w/ Parts & Accessories MS LC . New Life Scientific, Inc. The combination of mass spectrometry (MS) and nanoflow liquid chromatography (nanoLC) techniques are a key element of proteomics research. The strength of nanoLC/MS is that is enables the analysis of limited amounts of biological sample with high sensitivity. The variety of chromatographic phass and column configurations now available has resulted in widespread use of nanoLC/MS to tackle a broad range of biological problems. However, the low solvent flow rates used in nanoLC make chromatographic optimization more challenging than higher flow-rate applications. It is therefore important that thenanoflow interface to the mass spectrometer be robust, easy to use, and flexible to provide optimum performance on a wide variety of applications. The simplified emitter tip and column replacement with low dead volume finger tight connections with quick release of spray assemble. Compatible with all nanoLC systems and column configurations, including sorbent-packed tapered emitter tips for high quality separations. New Life Scientific technicians were unable to test this instrument. Based on the visual inspection, there are no signs of failure or damaged discovered. There is a 90-day money back guarantee that this product will work when incorporated into your system with your consumables, or you can request to return it. This product is untested, in excellent cosmetic condition, and will be sold as a working product. Untested, in excellent cosmetic condition.